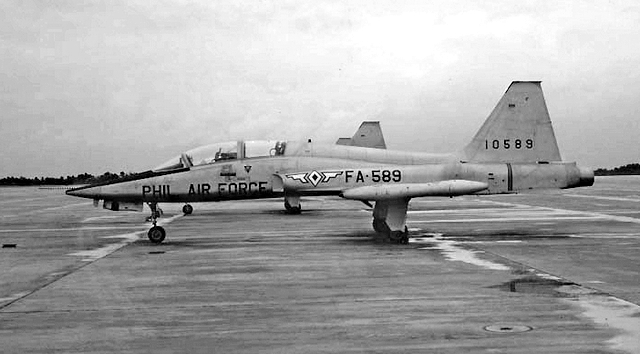 Discussions were held in 1964 between the Philippine and the US government to seek a replacement of the elderly North American F-86F and F-86D at the time in use as fighters. The offer for Northrop F-5s to be received under MAP aroused little interest as the local goverment preferred to receive two Squadrons of Lockheed F-104. 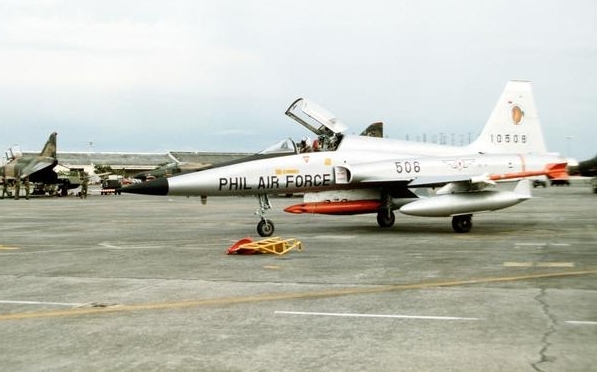 This request was not accepted and two Northrop F-5 Squadrons were initially planned August 27th, 1965 under the Philippine-US military agreement with assignment scheduled as follows: 9 aircrafts from US Fiscal Year 1964, 10 from FY 1965, 3 from FY 1966, 7 from FY 1967, 14 from FY 1968, for a total of 43 aircrafts.The first seven, Fiscal Year 1964, Northrop F-5A and two Northrop F-5B were handed over in July 1965 at McClellan AFB (USA), arrival in to the Philippines followed on 25-10-65, but due to a reduction of military aid and changes of priorities only one unit (6th Tactical Fighter Squadron) could finally be re-equipped with Freedom Fighters, further deliveries following with 9 Fiscal Year single- and 1 two-seater, 3 F-5A from FY 1966. Six instructor pilots and 50 maintenance crew members attained training courses at Williams AFB in 1965. Aircrafts were delived in all metallic colour, last five digits of serial was painted on tail plus the code FA- and the last three serial digits next to the nationality markings. Some were named and wore the name on the nose, initially simply written on the metal, later embedded in a nose badge. Some changes to the colours was made during the years: a very dark blue stripe with a cobra (Squadron name) was worn on the tail during the years 1971-1972. Line-up at Basa AB in 1972 with 6th Squadron tail badge and aircraft name on nose. Camouflage was experimentated, but not definitely adopted. Northrop F-5B 10589 at Basa AB on a foggy day in May 1976. Some had special 6th Squadron colours on the tail (see below). These aircrafts suffered with the years from normal losses, aging, poor maintenance and shortage of spare parts due to funds mismanagement by the government and worsening of the country's economical situation. Additional aircrafts, to keep a limited strike capability, were procured from the Republic of China and the Republic of Korea Air Forces; unfortunately it is not clear when/how many have been actually received. in August 1997 two former Jordanian/US civilian Northrop F-5As, on the US civil aviation register for a short time. Four former Republic of China, seen at Mojave airport 1988/early 1989, have also been mentioned but there have never been reports to be in the Philippines. 5th Tactical Fighter Wing - 6th Tactical Fighter Squadron "Cobras"
The 6th Tactical Fighter Squadron was part of the 5th Tactical Fighter Wing, based at Basa AB, equipped with North American F-86F when it received its first Northrop F-5A in 1965. 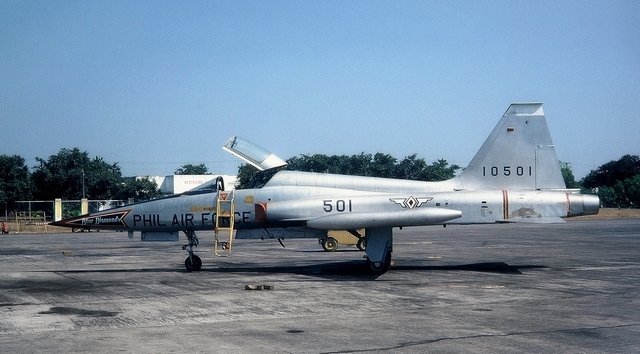 Its main duties were daytime air defence cover, armed with AIM-9B Sidewinders, over the islands of Luzon and Visayas (all weather interception being till June 1968 assured by Philippine North American F-86D, later delegated to USAF units equipped with appropriate aircrafts) and ground attack. Northrop F-5A 10504 in the alert hangar at Basa AB in August 1975 armed with AIM-9B Sidewinder. Of note tail with blue stripe and big 6 (Squadron number). with the arrival of the Freedom Fighters; it flew its first exhibition on 02-05-68 with six aircrafts. took place in the Republic of China (Taiwan). 1976, 1977, followed by the disbandment at the end of the year. Northrop F-5A, tail painted serial 69148, named Lightning. Exhibitions were resumed in 1986 with 6 Northrop F-5A, to stop the same year and being resumed in 1995/19967/1998 and, definitely, ending with one exhibition at the 52nd PAF Anniversary Celebration in 1999. Aircrafts were already at that time too fragile to allow acrobatic manoeuvers. Regular patrol flights were undertaken in 1968 from Mactan AB to Sabah, cannons fully armed and three external tank due to distance. Aircrafts of the 6th TFS participated betwen 1971 and 1973, together with North American T-28D and F-86F, to the fighting against various insurgents in Luzon island and the Visayas islands, mainly muslim, among which the important battle for Sibalu Hill (Jolo) in November 1972. Northrop F-5A and F-5B (together with North American F-86F and Lockheed T-33A flew between 1st an 09-12-74 again against insurgents gunnery straffing, bombing missions destroying several boats, ammunition and fuel dumps in the area of Zamboanga del Sur. Armistices were declared and broken several times in the following years, resulting in a continous guerrilla war, mainly fought by COIN aircrafts. These fightings are still going on today. By 1977 there were 9 active single-, 2 double-seaters plus 2 others F-5A withdrawn from use. 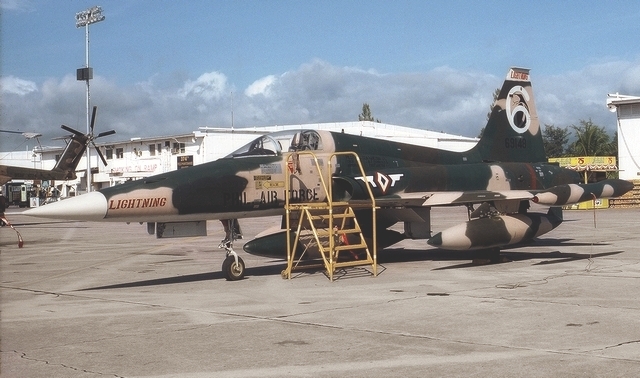 Most were deployed to Mactan to fight insurgents in the Visaya Islands; there were 7 single- and 2 two-seaters in November 1977.
increase range, in company of several F-5A and North American F-86F. 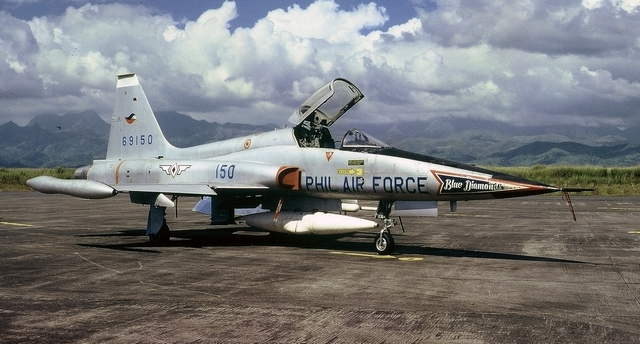 Another duty was the defence of Philippine interests over the the Spratley Island (called Kalaayan by the Philippines), secured in 1977 and beginning 1978 by some plus North American F-86F, based at Puerto Princesa. Air combat, particularly using the Colt-Browning M-39 cannons, was trained intensively using an underbelly target, as shown applied to Northrop F-5A 69150 in December 1980, or an underwing one. Northrop F-5A 69150 at Basa AB in September 1980 with underbelly target. 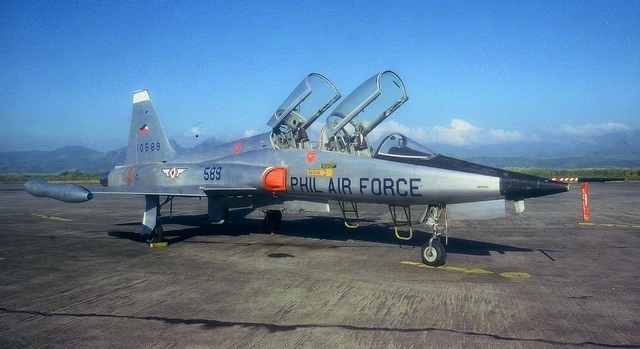 Philippine Northrop F-5A participated to the "Cope Thunder" together with USAF aircrafts during various year. The year 1984 saw the participation from Clark AFB of USAF F-15, F-4E, T-33A, US Navy A-6, Indonesian F-5E plus various transport, AEW aircrafts and helicopters. and McDonnel F-4E 3rd TFS during exercise "Cope Thunder '84". The 6th Fighter Squadron was also present to the "Cope Thunder '85" edition. Hereunder Northrop F-5A 10506 pictured on 11-01-83 during rolling for take-off at Clark AFB with brightly, orange painted AIM-9B Sidewinder and rocket launcher. On a secret letter dated 14-05-76 sent to the US requested to procure under MAP eleven Northrop F-5E. This was not supported by the local embassy and it had no follow-up. Instead twenty four Chance Vought F-8H had taken air-defence role over from 1978 but in 1988 they had to be retired due to corrosion, high operating costs and lack of spare parts, leaving again the Freedom Fighter as the only fighter available. Unusal was the participation of four Freedom Fighters to the film "Apocalypse now" in 1979, simulating a napalm bombs attack in South Vietnam. They actually dropped cansters that looked like napalm canisters; special effects set a huge fire of 1'200 gallons of gasoline. Overthrow of the Marcos government in February 1986 brought unrest in the country; the 5th Wing didn't participated to operations. 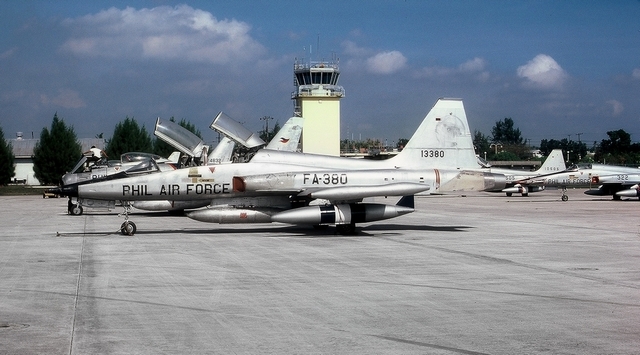 During a military coup on 01-12-89 several Northrop F-5A and F-5B and their pilots, temporarely based at Mactan AB, were captured by insurgents; only four F-5A/F-5B under maintenance at Basa AB remained at government disposal for the defence of Manila. They were immediately put back into operation to support the lealist forces. Two single- and on doubleseater established combat air patrols with the order to shoot rebel aircrafts down; several rebel North American AT-28D were intercepted not shot down as the pilots wanted to avoid shooting on collegues; they were forced to return to their home-base Sangley Point AB. An F-5s rocket attack against this base followed to put the T-28Ds out of use but was ineffective as the rebel aircrafts were purposely missed. A second, cannons/rockets attack, was definitive when 3 Northrop F-5As damaged/destroyed 7 AT-28D and 1 Sikorsky AUH-76 at Sangley Point; unfortunately one Freedom Fighter was lost in a crash-landing on return to Basa AB. The following day a mission, with unguided rockets, was flown against insurgents at Camp Aguinaldo Marine Camp in Manila. Finally the rebels surrended on 07-12-89. By the beginning of the '90s only eight single- and two double-seaters were available, few being airworthy. Following eruption of the approximately 20 kms distant Mount Pinatubo in June/July 1991 Basa AB was damaged considerably by ash. It seems that some F-5s were destroyed when an hangar collapsed; the others were transferred to Clark AFB, former USAF base, where they remained. Defence funds became very scarce when US Military Assistance Program payments were withdrawn following the transfer of Clark AFB from USA to Philippine possession on 26-11-91 and of Subic Naval Base on 26-11-92; the radar network had to be closed leaving the Philippines without coverage and the Freedom Fighters were left without guidance. Puerto Princesa AB housed again in March 1992 some of the remaining airworthy aircrafts, due to tension with China over the Spratly Islands. Some of these had obtained in the meantime a new camouflage, others were gray painted (same as former Korean AF ones). In 1995 the Philippines came again in clinch with China People's Republic regarding the control of islands and reefs in the Spratly archipelago and Mischief Reefs, about 400 km west of the Philippine island of Palawan. 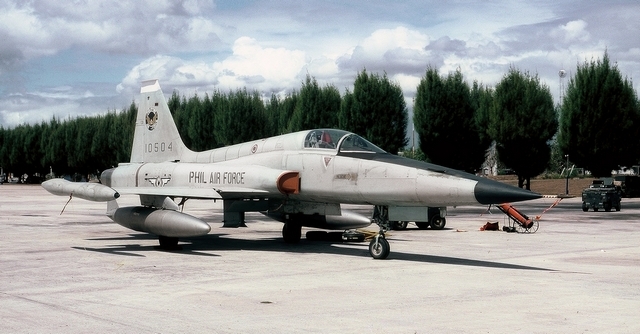 The only 5 airworthy Northrop F-5s were transferred immediately to the nearest airport, Puerto Princesa, but returned to their home base when tension decreased. Their fighting potential was very limited because of the short endurance of the fighters and the airframes fatigue did not allow sharp combat. Very few remained operational: four in 1991 and 1992, two in 1993 and 1994, five in November 2000; air-to-air missiles AIM-9B Sidewinder were anyhow refurbished in 1999. 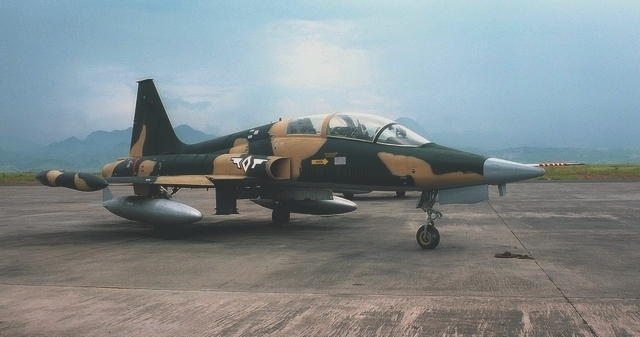 Camouflaged Northrop F-5A 69124 (without rudder) with toned down seal and an unknown, possibly 13380, F-5B, with coloured seal, in May 1998. Both have the "Blue Diamonds" badge with number 1 painted on the nose. 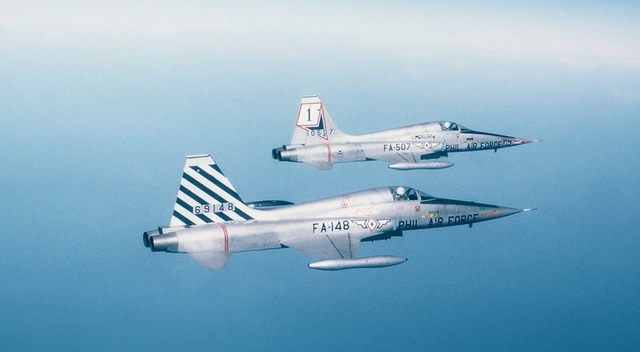 Some relief for the ground-attack role was the modification of some of 24 Siai S.211 trainers received in the early '90s; parts of the Northrop F-5s were used to improve their light attack configuration: optical sighting system, UHF radios, Head Up Displays and 20mm cannons from retired airframes were incorporated in the former trainers. 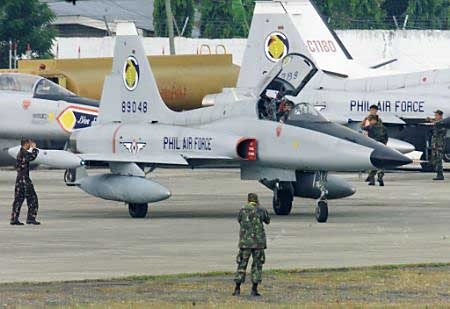 At least 3 Northrop F-5As participated to the all-out war against muslim kidnappers in Sulu islands during May 2000. They were not suited for this kind of war and were just used for a show of force by the Philippine president; the same aircrafts flew over the Manila presidential palace to oust the president on 20-01-01. Almost contemporanously, one Northrop F-5A and one F-5B, together with an Siai SF.211, participated as interdiction aircrafts to the Special Troops Exercise "Teak Piston 01-2" in January 2001 together with 2 special operation USAF C-130 and 3 Sikorsky MH-53. 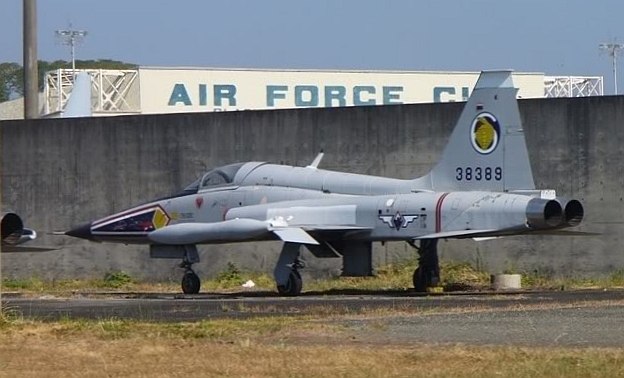 A new Air Defence Alert Center was completed by September 2001 at Clark AB, enabling partial control of Philippine territory and a scramble of the Northrop F-5As on alarm. Unfortunately this was very short lived. A tentative to buy Northrop F-5E/F-5F Tiger (Project Peace Magohany) took place in 04-05-76 with the request to use USD 4.7m Fiscal Year 76 Foreign Military Sales credit for an initial payment of 11 Northrop F5E, but by 03-01-77 (the expiry date) the US Letter of Offer had not been signed, due to the desire to evaluate Chance Vought F-8H, Douglas A-4C and other fighters; 25 active and 10 Chance Vought F-8H for spare only were bought in 1977. By 1986 it was clear that the life of the remaining Freedom Fighters was very limited. Several considerations were made to obtain new aircrafts. another purchase attempt was made in April 1997, when discussions were kept with a private company in order to obtain 13 Canadair CF-5A in return for mining rights, but these didn't reach maturity. Alternative solution to extend the structural life of the available aircrafts for USD 50m, considered in February 1998, was fruitless. Possible acquisitions of second generation fighters were former New Zealand A-4K/TA-4K, Saudi Arabian F-5E/F, again without follow-up; political consideration stopped in 1999 the acquisition of withdrawn from service Republic of China (Taiwan) Northrop F-5E and F-5F, even if these were offered at an friendship price, first to be first returned to the USA and later to be sold to the Philippines. Third generation fighters were also on the shopping list: in USA stored Pakistani General Dynamics F-16s (counter-trade with engine manufacturer Pratt-Whitney company was considered), F-18C/D, Mirage 200-5, Gripen. 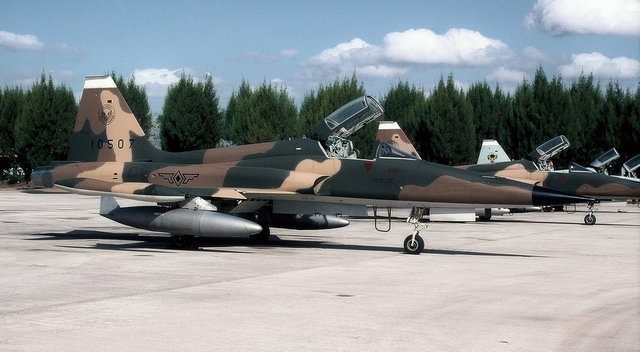 In a final effort to have some sort of air defence/support for the army the option to upgrade its remaining Northrop F-5A/F-5B was studied beginning 2002. 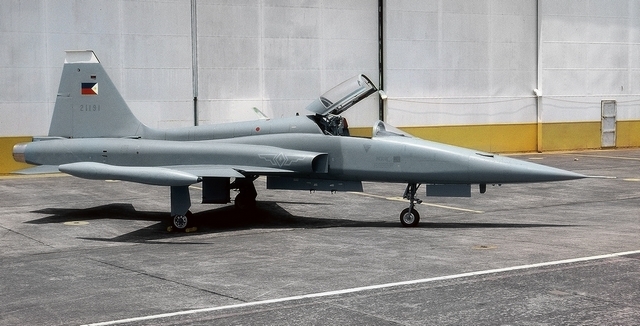 An offer by the Taiwanese Aerospace Industrial Development Corporation Corp. of up to 26 former Republic of China Northrop F-5E/F-5F was considered as well as looking at retired Saudi and Swiss aircrafts. The deep Asian financial crisis, at the time at its peak, together with change of priority to domestic insurgent fighting, put an end to all these efforts. Operational retirement by the Air Defence Wing, both for technical and economical reasons, came after the crash on 02-05-02 of Northrop F-5A serial 21176, killing the pilot. An 2003 agreement with Korea to donate additional aircrafts as well as plans to upgrade the remaining airframes with radar and advanced avionics was not activated. Fifteen aircrafts were put in storage: 5 Northrop F-5A at Basa AB, 8 Northrop F-5A and 2 F-5B at Clark AB, these last initially in two hangars, one containing those in better and one in worse shape, later stored in open-air. Official withdrawal of the Northrop F-5A and F-5B came on 30-09-05 when a retirement ceremony was held at Basa AB with a line-up of nine aircrafts. Spectacular two-tone gray Northrop F-5A 21191 initially painted for the official retirement ceremony on 30-09-05. It was actually repainted before the ceremony in "normal" gray colours to better represent the operational aircraft. 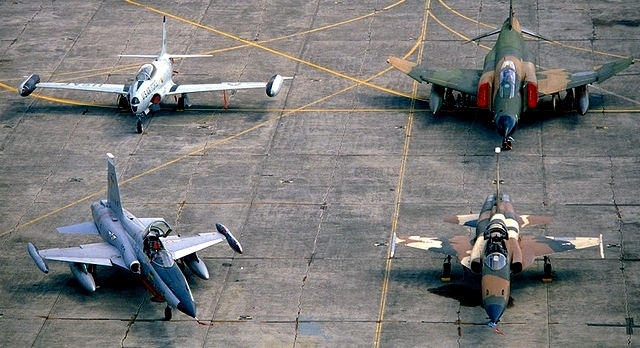 Some of the remaining aircrafts are preserved at various Bases and at the Philippine AF museum (see serials lists), others were still in storage at Clark AB in 2009. 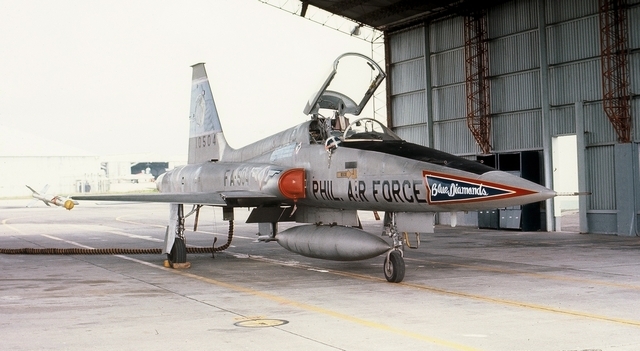 Northrop F-5A 38389 stored at Clark AB, "Blue Diamonds" and Philippine Air Force inscriptions overpainted.